Cousin #3 got married this year – first Molly, then Lynn, and now Stacy. So we were off to Michigan for the second time in two weeks! Only this time it was to the opposite “shore” of Michigan – the Lake Michigan side. Stacy grew up in the Upper Penninsula on Lake Superior and she and her sisters will say, “It’s not a lake if you can see the other side!” She, like her older sister Kelly, wanted a casual outdoor wedding with photos taken on the beach at Lake Michigan. Stacy really got lucky with the weather – it was sunny and 80 degrees. The bridesmaids in their strapless dresses actually got sunburned while being photographed in the sand dunes and on the beach! I had to remind Stacy that her first choice of dates was August 29th, but that was Lynn’s wedding. She gave me two other dates and I helped her pick September 12th. Well… August 29th was windy and COLD, so I kept telling her, “you OWE me!” I can’t even imagine how cold it would have been on Lake Michigan on the 29th – yikes! Molly and I started photographing Stacy and Paul at their house near Holland, then the wedding party hopped in a van and we all went to the lake. 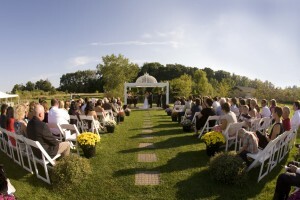 The ceremony and reception was held at nearby Apple Blossom Chapel and Gardens. They got married under a pretty gazebo, and then ate and danced in an ENORMOUS white “circus” tent. 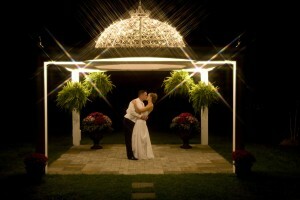 The gorgeous sunset faded into a chilly, star studded night sky and little white lights lit up the grounds. It was all so beautiful, Stacy couldn’t have ordered a more perfect day! It's hard to run in the deep sand! I love the look on Stacy's face: when she gets nervous or emotional, she bites her lip. So cute! To view more images of Stacy & Paul, visit our fan page on Facebook.